Power Wheels parts are available at Nelson Appliance. Come to us for batteries, chargers, shifters, etc. 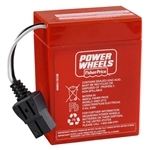 Power Wheels 6 Volt Red battery 00801-0712. This genuine part fits many 6 volt and 12 volt Power Wheels ride-on toys. Earlier 12 volt vehicles used two of these batteries. 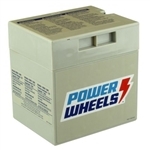 Power Wheels 12 Volt Gray battery 00801-0638. This genuine part fits many 12 volt Power Wheels ride-on toys.